So a very smart friend of mine brought up the point of the mechanism working underwater. I didn’t know. So I had to find out. To observe whether the mechanism will work in an underwater environment. The cutter mechanism is going to be used in order to deflect the water from the air to the underwater piping system giving humans the illusion that the water is jumping. Each nozzle will be timed in such a way that the water will appear to be jumping or leaping from place to place. In order to cut the water the Cutter mechanism will push and pull a plate in from of the orifice in order to deflect. We must be certain that water will not affect the mechanism. The mechanism must be able to cutter the water in either a partially or fully submerged environment. This test is designed to find out if the water will cause any problems. We are particularly concern with the solenoids and how they will perform. The setup for the cutter mechanism is the same as the setup in other cutter mechanism tests with the small addition on waterproofing. I applied a liberal amount of hot glue to the connections and any point that might have a leak. I filled a 5 gallon bucket with a small amount of water just enough to cover the mechanism. The cutter mechanism was suciffiently waterproofed and I was able to contain the magic smoke. The cutter operated as designed. The video below show the results. The cutter mechanism performed well underwater. The proof of concept was succesful and the mechanism will be introduced into the design. The mechanism was observed to be a bit slow moving from position to position, but has not be confirmed. However, the majority of the drag is probably due to the vertical plate. The Laminar Nozzle will have a significantly reduced drag since, the cutter mechanism will have a U-channel instead of an L-bracket. This should alleviate any drag induced problems. Ok, it’s pretty late and I need to get to bed so that I can get up for work tomorrow, but I thought I would as least throw these images up. I’ll edit this post tomorrow, and give a full description..
It’s really hard to make a movie and think how to explain things clearly. If you focus on explaining things clearly the video is out of focus and aren’t even focused on the right part. On the other hand if you focus on making the movie then the explanation suffers. BUT..if you are careful and get just the right balance of focus on explanation and on the movie…..you just get a crappy movie clip. I try! You get to see some cool moving things though! Since I have my solenoids working properly I started working on the cutter mechanism. Solenoids are really neat mechanisms and if it weren’t for them generating A LOT of heat I wouldn’t even have to design a mechanism. But they do, so I will! The purpose of this mechanism is to allow me to keep the cutter open or closed for ANY amount of time. I started thinking of all these neat mechanisms that would allow me to latch the solenoid. These were pretty complex but eventually it got more and more simple. Eventually it came down to this design. The figure below show the solenoids in the starting position. You can see that the solenoid plungers don’t have any magnets attached to them or anything. The magnets are on the brackets at the end. The solenoid at the top is in the on postion, meaning the current is running through it to attract the plunger and retract it. The bottom solenoid is in the off position. I don’t have a representation of a hole in this experiment but imagine that the hole is just to the right of the bracket in the middle. In order to cutter the water the bottom solenoid will turn on, but just for a moment (200 ms). 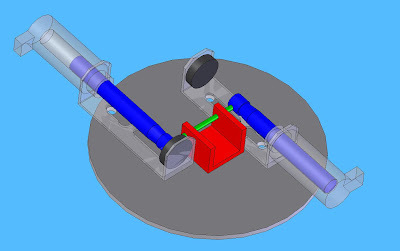 Once the cutter mechanism has moved to the “closed position” (see figure below) the upper solenoid engages the magnets and the valve is now closed and all current is off. In order to move the cutter mechanism basck to the start the top solenoid is turned on and the entire process starts over again. I can’t say that this is the exact design that I am going to use yet. I still have a few other ideas that I have before I commit to one design, but so far I am pleased with these results. So I only run current through it to move the mechanism once it arrives at its destination the current turns off and remains in the position until the next solenoid is turned on. That means no excess heat, and remember HEAT is the enemy in electronics. I won’t detail the setup exactly in this post, but I just received my solenoids from Goldmine Electronics and they are awesome. Thanks to Zachary for pointing me in the right direction on that one. I’ve never played around with solenoids, and they are very basic, but what can you expect when you only pay $0.99 for each solenoid. How do solenoids work? Well, when you run current through a wire you get a magnet field. This magnetic field circles around the wire. When you wrap the wire in a coil you get a stronger magnetic field! Wrap it enough times and run enough current through it you can get a large enough field to attract an iron core plunger. When the current turns on the plunger is attracted and retracts. When the current turns off a spring returns the plunger back to its original position. That’s the basics of a solenoid. Solenoids need a large current to run through it in order to create a large enough magnetic field. Since nothing is a 100% efficient you get a lot of HEAT. Heat is the enemy in electronics. If things get too hot things burn up and solenoids are no exception. So you can only run them for about 25% of the time and they have to rest for 75%. That is going to make it difficult for the cutter mechanism. 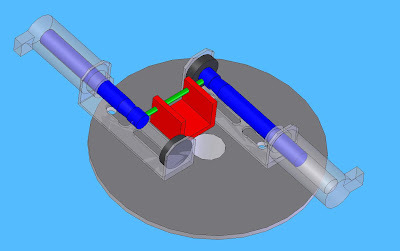 Since I want to be able to keep everything open or cut the water at ANY given time, I will have to think of a clever mechanism that will hold the cutter in its proper place one the solenoid have moved it to its desired position.